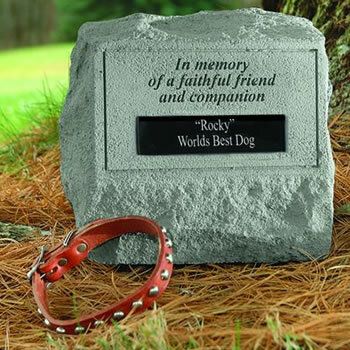 This beautiful pet memorial headstone has an urn and a place for you to add your own text. It has a rich texture with the look, feel and weight of true stone. Made of cast stone, it is weatherproof and has year-round durability. A container in the bottom can hold a memento of a beloved pet. 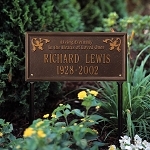 Note that the size of the headstone allows for discrete placement in front of a tree or in a garden. Engraving: "In memory of a faithful friend and companion." This headstone can be personalized with up to 3 lines with a maximum of 18 characters per line. Personalization is etched on a black marble plaque.